It was like a sad ending to a tremendously entertaining play as the curtain fell for the final time on the 1996 Kaneland football Knights. This time the bad men in black were the victors as the Driscoll Highlanders defeated the team in white, 24-6 in the second round of the IHSA class 3A state playoffs. The final result was more than the lose of one game, but rather the ending of an era. For 13 seniors their presence on the high school gridiron, will never happen again. For them, as the forth quarter was ticking down, came the realization that their high school football career was coming to an end. These were the 13 that had been the glue that had made Kaneland football team as good at it was. A team that made school history. A team that introduced Kaneland "D" to the community. A team that was rich in pride and had a low tolerance for losing. But as everything in life does, it too came to an end. It all started with this season's Achilles heal -- the fumble. Kaneland begun the game as everyone had hoped. Stopping Driscoll on their opening series, forcing a 4th and 12, punt. Ryan West took the kick and returned it 30 yards back to Driscoll's 18 yard line. Five plays later the Knights had a first and goal at the 2 1/2 yard line. But on the next play, the dreaded Kaneland fumble struck again. As the Driscoll plays players where pointing that they had the ball, Brain Herra emerged from the pile with the ball to save the moment. But Kaneland's relief was short lived, as on the very next play they fumbled again, and this time there was no good guys to recover it. Kaneland's "D" dug in and forced a third and 2. But a slick play-action pass, opened up wideout Shayne New for a 89 yard reception for a quick Driscoll touchdown. With the point after good, Kaneland was facing a 7-0 deficit instead of a 7-0 lead and the momentum has shifted to the home team. On Kaneland's very next play from scrimmage they fumbled again. Ten plays later, the Knights were looking at 14-0 uphill battle. With less than 10 minutes into the game, the worst of all scenarios was happening -- could this be a Kaneland blowout? But the Knights showed their character with the "D" holding Driscoll to drives of only 6, 19, and 0 yards, as the offense moved the ball to Driscoll's 28, 40, and 18 yard line on successive drives. However, the end zone remained elusive to the hard fighting Knights as the half ended 14-0. The start of the second half things got no better, as the Highland's added a 36 yard field goal on their first possession. Then will less than two minutes left in the quarter, Jason Aspito, who had been a thorn in Kaneland's side all afternoon, broke loose for a 43 yard sideline scrapping TD run to put the final nail in the Knights coffin, at 24-0. Ryan West caught a 8 yard Aaron Siebens pass in the middle of the fourth quarter for Kaneland's lone score. But it was too little too late, as the two point conversion failed, resulting in the final score of 24-6. In the end Kaneland had more first downs 16-14, but the Highlander's had more total yardage 346-231, out distancing the Knights is both passing 224-141 and rushing 122-90. But the loss cannot overshadow a great great Kaneland football season. The Knights finished 8-3, won the conference championship, advanced to the second round of the playoffs, placed 10 players on the all conference team, and set a new standard for defensive excellence. A standard for future Kaneland teams to strive for. And to the 13 seniors who won only 4 games as freshmen and sophomores, they can hang up their cleats knowing, that over the last two years, they were instrumental in turning the Kaneland football program around. 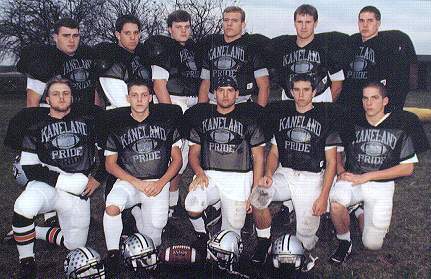 They were to first one's to get Kaneland into the state playoffs, they introduced Kaneland "D", and they passed on the flame to this year's freshman and sophomores, with the desire to win, live playoff experience, and the standard for conference play. "(These) seniors are an absolutely amazing story", notes Kaneland coach Joe Thorgesen. These 13 are -- #1 reciever/defensive back Luke Putzler, #21 All-conference defense back and interception leader Nick Gillis, #33 Conference defensive player of the year Steve Goldman, #40 2000+ yards over last two years All-conference tailback Dan Kenny, #45 starting defensive back Aaron Augusten, #57 starting lineman B.J. Staker, #58 All-conference defensive end Shane BIrd, #65 starting center Matt Brown, #70 two-way starting lineman Jason Woosley, #72 All-conference offensive tackle and starting defensive linemen, Andy Swanson, #76 Injured lineman Derrick Smith, #77 utility lineman Donnie Thomas, and #82 All-conference "touchdown saving" defensive back Paul Aspengren.